It’s no secret, Yveltal EX is the strongest new card to come out of the X/Y base set. It will go in a multitude of decks, but it’s most logical early inclusion will be to fit it in with other dark Pokemon to form a new dark deck. I’m still not quite sure how the dang thing is supposed to be announced of course. That first “L” really throws things off a bit, I’m pretty sure I know the right pronunciation but it doesn’t quite sound natural yet. In the midst of working on pronouncing Yveltal, I have built a Yveltal EX deck, and it’s had some solid testing results so far. Let’s go over some things in the list, because this is quite a makeover from a standard Darkrai EX deck from last format. Darkrai has even been regulated to just two spots, and honestly it’s mostly used for free retreat and you don’t attack with it in most games. I’ve decided to go all in with the new Yveltal from XY. 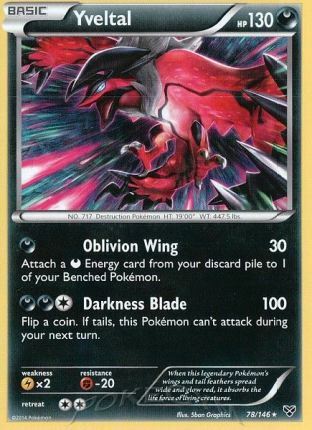 It’s mainly used for its first attack, Oblivion Wing, which costs [D] and does 30 damage and lets you attack a [D] from your discard to one of your Pokemon. Basically it’s Raiden Knuckle on a non-EX for Dark Energy. 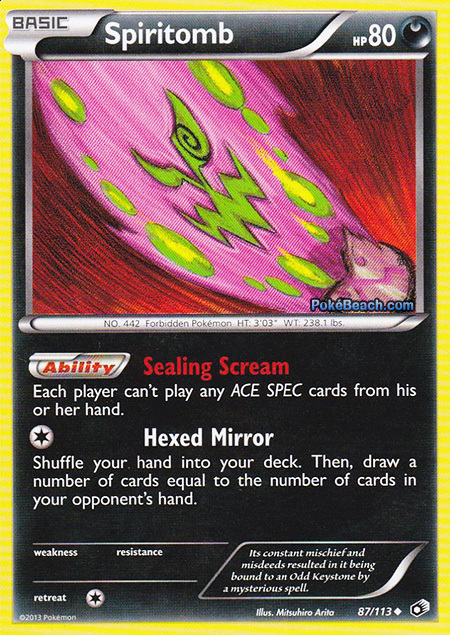 The reason I like this card over Sableye in this deck now is because of the mirror match. If your opponent is dependent on Dark Patch and Sableye to setup, they can too easily fall behind in the mirror match as Yveltal with a Muscle Band and Hypnotoxic Lasers can easily KO a few Sableye to start the game. You both are working on getting setup through different means, but with Yveltal you can take some prizes during the setup phase. It’s also the superior option against Virizion/Genesect, as Hypnotoxic Laser spam isn’t as useful against them. So with Yveltal, you can start putting damage on your opponent’s Pokemon to set them up for KO’s while setting up your field, significantly improving your matchup. One interesting thing that Oblivion Wing does for the deck is to let you setup through that instead of Dark Patch, allowing you to better save those for later in the game to give you a big late burst. With 10 shuffle and draw supporters with N, Shauna, and Colress, you can conserve your resources fairly well compared to past Darkrai decks that were largely dependent on only Juniper, N, and Bicycle. The card is also a strong attacker against EX’s if you can get an early Silver Bangle going. With that and Hypnotoxic Laser and Virbank City Gym, you can 2HKO Ex’s with Oblivion Wing which is quite strong for just one Energy. 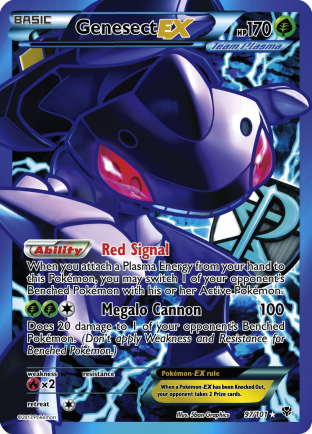 This is your main attacker in the deck instead of Darkrai EX, just because it’s such a strong attacker in comparison. Its first attack, Evil Ball costs [D][C] and does 20 damage plus 20 more damage for each Energy attached to both yours and your opponent’s Active Pokemon. Its second attack, Y-Cyclone does 90 damage and you move one of the Energy attached to Yveltal EX to one of your benched Pokemon. It’s really hard to describe the situations in which you use Y-Cyclone instead of Evil Ball, as generally you will be looking to Evil Ball to score big OHKO’s. However, if you can OHKO something with Y-Cyclone, then it usually makes sense to use that instead of Evil Ball. 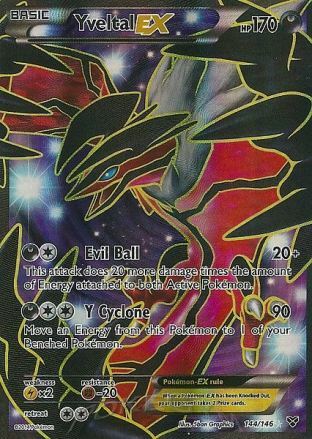 Additionally, if you aren’t scoring the OHKO with Evil Ball, then Y-Cyclone also makes sense. You can use Y-Cyclone to further setup your field. You can move DCE’s to Bouffalant’s, getting an attack in while setting them up. You can also move them to other Yveltal EX to stack Energy (or continuously Y-Cyclone with Darkrai’s free retreat between two Yveltal EX). Evil Ball is an insanely strong attack. Just for the standard [D][C], you’re doing 60 base damage. Add a muscle band, that’s 80 damage, and a Hypnotoxic Laser with Virbank City Gym that’s already 110. That’s before taking into account any additional Energy on Yveltal EX as well as any Energy on the Defending Pokemon. For just 3 more Energy between yours and your opponent’s Active, that can get up to 170, and for 4 more Energy, that’s 190, enough to OHKO all non-Mega EX’s in the game. It’s not too uncommon to just explode for a big Evil Ball out of nowhere. I usually just work on setting up multiple Yveltal EX with Oblivion Wing to start the game, and usually have two of them setup with a Dark and a Double Colorless Energy on them. From there, I have a base of 80 damage, 100 with Muscle Band, and 130 with LaserBank. Now I can get up to 170 damage just by attaching another DCE, or 190 with a Dark Patch and DCE attachment. That’s before even taking into account any Energy on the Defending Pokemon, so often less will be needed, and if it’s not an EX I’m attacking into, then even less Energy will be needed. Yveltal EX is quite strong indeed! I think this is such a common tech in Darkrai decks these days that it doesn’t need much explanation. One of Virizion/Genesect’s strenghts against Darkrai has been the OHKO potential they have, while you couldn’t OHKO them back. Now, however, with Spiritomb and Yveltal EX in the mix, you can completely tilt the tables against them. With Spiritomb, they lose access to their OHKO potential, while you still have it with Yveltal EX. As they will be using 2 and 3 Energy attackers, Yveltal EX is very strong against the deck. It just needs 4 Energy and Muscle Band to OHKO Genesect EX’s that are attacking. Additionally, some Darkrai decks like to setup via Sableye abusing Dowsing Machine or Computer Search. Spiritomb can eliminate them from using this strategy. Lastly, just against any deck when you’ve played your Ace Spec and your opponent hasn’t it’s naturally useful. Hexed Mirror also adds another layer of consistency for the deck. As the deck once again wants DCE in it to be used with Yveltal EX, Bouffalant becomes a much more viable attacker for dark decks. With Muscle Band and Hypnotoxic Laser/Virbank City Gym, you can OHKO 170 HP EX’s, and against 180 HP EX’s, Silver Bangle can be used to achieve the same effect. 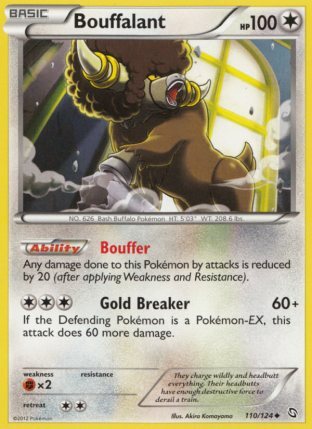 I actually decided on going with the 3/2 Muscle Band/Silver Bangle split just because of how strong of a threat Bouffalant can be for the decks, particularly giving you a non-EX game against Rayboar and Blastoise decks. Being able to OHKO EX’s with a non-EX is just too strong to pass up. With Y-Cyclone, you can setup Bouffalant with Yveltal EX, and then with Scramble Switch you can go back into a Yveltal EX attacking game which is very strong. I just want to touch lightly on the two one-of’s I decided to include in the deck. Professor’s Letter is a very good card in decks that like to manipulate Energy from the discard pile. 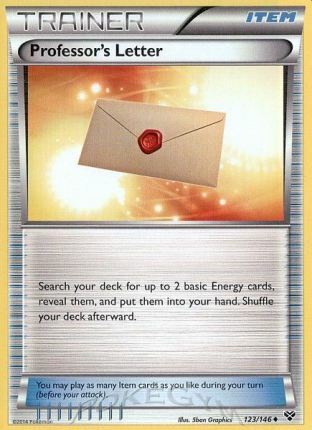 In conjunction with Ultra Ball and Professor Juniper, Professor’s Letter can give you two Energy to put in the discard pile to put back on with Oblivion Wing and Dark Patch. Drawing two Energy out of your deck also incrementally improves your consistency as you are more likely to draw into something more useful than those two Dark Energy later on. I was left with just one last open spot in the deck after including everything I really wanted. When this is the case, I like to put in Pokemon Catcher, as it is a game that can win you games, but I really don’t like basing my strategy around it. Just hitting that one heads can significantly swing a game. At my league tournament last week, I won one of my games against a Fairy deck from hitting heads on Catcher after playing a Shauna. I think I probably would have won that game otherwise, but it sealed the deal for sure. Other tech options are Absol, for another non-EX attacker to mix in against things like Blastoise when they’re attacking with Black Kyurem non-EX. A one-of Sableye is another option for getting back Laser, Dark Patch, tools, and Scramble Switch. Lastly, Keldeo EX is something to look at if Trevenant/Accelgor gets big. I don’t want to get into matchups too in depth, as you really need to test them out and figure out the strategies to really get them down for yourself. However, I want to touch on them lightly to give you a good feel for the deck’s position in the meta game. Virizion/Genesect – This is a pretty positive matchup for you as long as Spiritomb isn’t prized. Even if Spiritomb is prized, you still have a pretty good matchup against it just because you can put on so much early pressure, and setup attackers so easily, and they only can G-Booster so many of your Pokemon before they run out of Energy. Blastoise/Emboar – This is a fairly even matchup. This is probably the best that a non-Garbodor dark deck has fared against these two decks since they became things. Bouffalant really helps to even these matchups for you, and Yveltal EX punishes them anytime they want to stick Energy on something and attack with it. Plasma – This is probably your toughest matchup. Thundurus EX can easily 2HKO a Yveltal EX for just one Energy. However, this isn’t really too much of an issue for you as you easily 2HKO it back. Lugia EX can OHKO you with Muscle Band, but again, this isn’t the biggest issue ever since you can easily OHKO it. The issue? 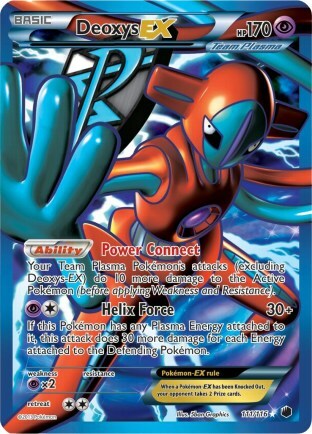 Deoxys EX. When you start putting a lot of Energy on Yveltal’s to OHKO stuff, Deoxys EX is there to punish you. If you have 4 Energy on your Yveltal EX, then Deoxys EX OHKO’s it with Muscle Band. This makes it so Plasma has good counters for you through and through. The best way to approach the Plasma matchup is to use Y-Cyclone to 2HKO any Thundurus and then setup your Bouffalant’s and try to OHKO their EX’s with your non-EX. The good thing is you control Deoxys’ damage, so if you play it smart with your Energy, then you can do alright against Plasma. It’s really not a bad matchup, more of a 50/50, but it takes a lot of thinking to achieve victory. Fairies – This really varies based on what type of Fairy deck your opponent is playing. I think a good straight Fairies build has a bit of an advantage against you as they can OHKO you with Xerneas EX and Lasers, and they have Yveltal EX to punish you as well. The teched out version of Fairy is easier to beat, as they hurt more from losing their Special Energy. Overall, it’s the type of deck that doesn’t have many overwhelmingly good matchups against the top decks, but if you play it smartly, you have winnable matchups across the board. Because of the nature of a card like Yveltal EX and its raw power, you generally can just run over most stuff off the beaten path. As mentioned I played this deck at our league tournament last week, and one of my matches was caught on stream. It was against a Fairy deck, and here it is for you. 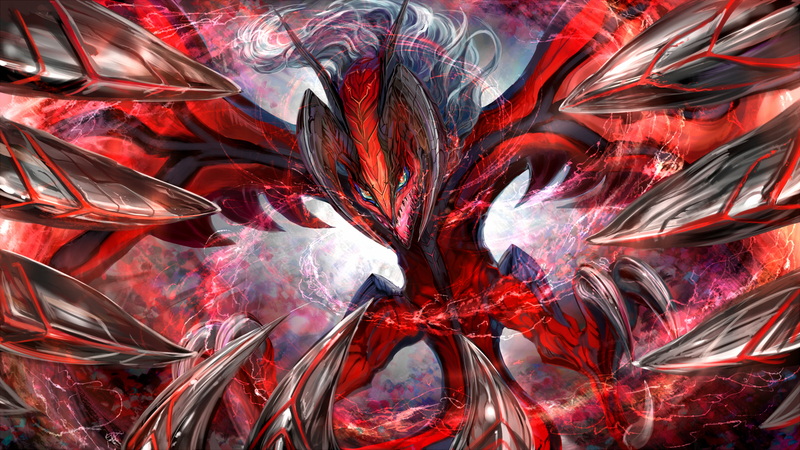 Yveltal EX is one of the undeniably strongest cards to come out of XY. It has a natural home in dark decks, and we’ll see it pop up in all sorts of decks just because of how strong it is. Some variant of this deck is something that you’re sure to encounter in the coming weeks during State Championships. It is also a relatively cheap deck to build. You get 2 Yveltal non-EX in the theme deck, and Yveltal EX will be coming out as a tin promo after week one of states. If you’re a budget minded player, this is a deck you can build for fairly cheap in just less than a month. I need to decide between DYG (Daarkray/Yveltal/Garbodor) and Yveltal/Darkrai/Bouffalant for my nest tournament (in fact my first). It’s a tough decision without knowing the metagame. Both decks are pretty awesome (all-terrain).